Maddie completed her Bachelor of Laws with Honours at Monash University. Her studies involved an emphasis on the criminal law, receiving awards and Dean’s recognition in criminal procedure, criminal investigation and ethics. Since joining the team in 2013, Maddie has developed a strong rapport with clients and professional contacts including Counsel and the Courts. 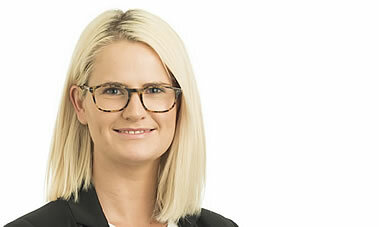 Underpinned by an advanced understanding of the procedural aspects of the Court system and day to day running of the firm, Maddie has excelled as a lawyer in Court since her admission to practice. Maddie is passionate about the criminal law and brings to her position an unmatched enthusiasm and thirst for knowledge. Maddie appears in the Magistrates’ Court for all criminal matters on plea hearings, bail applications, mention and contest mention hearings as well as carrying a large number of committal stream cases from filing hearing through to trial stage. She is an experienced advocate in County Court sentence appeals and regularly prepares conviction appeals with counsel. Maddie also practices in Intervention Order matters for both Applicants and Respondents in the Magistrates’ Court and in Intervention Order appeals to County Court. She has extensive experience in both Family Violence and Personal Safety Intervention Order matters and appears in court for these matters regularly. While the firm does not practice in family law, the sometimes inevitable overlap between family law and Intervention Order matters can be bridged by referrals and strong professional relationships with family law solicitors and barristers. Maddie also and instructs Counsel in County and Supreme Court trials and appeals. Maddie is a member of the Law Institute of Victoria.